At the beginning of 2014, I put together an article of some of my tennis predictions for the ATP tour in 2014. While making long range predictions in a sport as diverse and evenly matched as men’s tennis is very difficult, I’m pleased to report there were some successes among the range of predictions! Kei Nishikori did indeed emerge as a genuine Grand Slam contender at the tail end of the year, fighting out the final of US Open with another final debutante, Marin Cilic, who went on to take the title. The year also began with some of the biggest shocks and upsets in recent years with the Swiss top 10 player, Stanislas Wawrinka finally stepping out of Roger Federer’s shadow to take the Australian Open crown in January. In the French Open, the Big 4 struck back, with Nadal winning his favourite tournament in five bruising sets over Novak Djokovic. Barely a month later at Wimbledon, Djokovic got the chance to atone for the disappointment at Roland Garros, by consigning Roger Federer to a loss. My tennis prediction for 2015 is as a sort of “second half” to 2014. What I mean by this is that the trends we saw in 2014 that began to emerge will likely continue in 2015, but there is unlikely to be a sudden and sweeping revolution. The established elder statesmen of Federer, Djokovic, Nadal and Andy Murray will continue to win tournaments and be major players deep into the second week of Grand Slams. This is especially true as these four players begin to manage their workloads and sit out smaller tournaments in order to target the majors more aggressively. 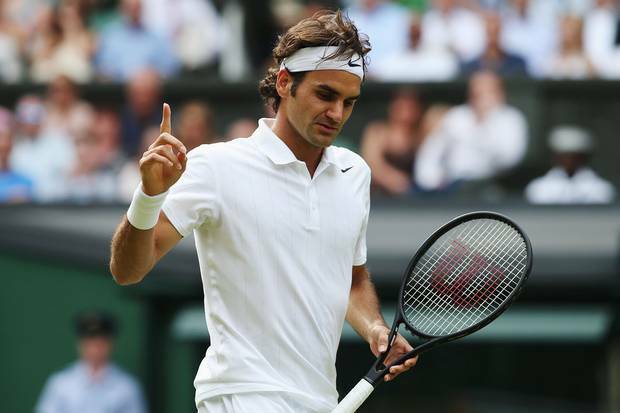 However, Federer is yet to break his minor drought of Grand Slams that has plagued him since 2012. Added to that, Murray and Nadal are both not in the peak physical shapes of their careers, with troublesome backs and knees taking their toll. While neither is likely to retire or miss large chunks of the season, it cannot be taken for granted that they will be present at all four major tournaments as they were in the past. Therefore, the new normal for the men’s tour will be finals being contested by more than the narrow group of 4-6 men who dominated these events in the last decade. This trend began in 2014, with Wawrinka, Nishikori and Cilic all reaching their first finals, and two of these three winning their first championships. Added to this list are some interesting challengers, including Grigor Dmitrov who has finished 2014 exceptionally strongly with multiple tournament wins to go with some strong Grand Slam results. In addition, Milos Raonic is one player who many have been waiting for to emerge with some meaningful successes over the course of a season, and 2015 is the year he must deliver on some of that potential. One step down from the new guard that will contest finals is the exciting new breed of players who caught the attention of the tennis world in 2014. Nick Kyrigos from Australia is probably the first name mentioned in this group, with a huge win over Rafael Nadal at Wimbledon taking many by surprise. Look for him to perform well in the first Grand Slam of the season, the Australian Open, buoyed by incredibly strong hometown support. Cilic is also another who should build on a great 2014, with over 40 wins to his name before he entered the US Open, which was the kind of form which carried him all the way to the final. Another trend of 2014 that will continue is of the coaches’ boxes of the men’s tour looking like a collection of former greats. Cilic won his first Grand Slam on the back of hiring Goran Ivanisevic, a former champion at Wimbledon. Meanwhile, his opponent, Nishikori, benefitted from the coaching talents of Michael Chang, while Wawrinka was able to draw on the experience of Magnus Norman. In a more surprising choice, Andy Murray has gone with former French champion, Amelie Mauresmo, to turn around his fortunes, while Ivan Ljubicic can be found giving advice to Raonic. It can be seen that those players who have engaged former greats as coaches have excelled. I have two theories as to why this is the case. The first is that each of the former greats who advise the current crop of players had long careers in the modern era. As such, they know the demands of the scheduling, how best to prepare for tournaments, and how to peak physically and mentally for the Grand Slams. The second major reason is giving players the keys to achieving the right temperament and winning the big moments in the biggest matches. Those who have done this already in their own careers are best placed to understand the unique pressure that prevents players hitting their best shots during the crucial points in the late stages of major tournaments, and this transferred knowledge gained as a result of personal experience has helped many players excel in 2014. Whichever way the tennis predictions turn out, it’s likely that at the end of 2015, we may well have one or maybe two new Grand Slam champions to be talking about. I can’t wait for the season to begin! From "Tennis Predictions 2015" To "How To Play Tennis Efficiently And Become A Better Player"